Mountains mean different things to different people. For me, Maha Bhir (Honey Cliff) of Darkha, named after its sheer cliffs, created terror and respect in me as a young boy. 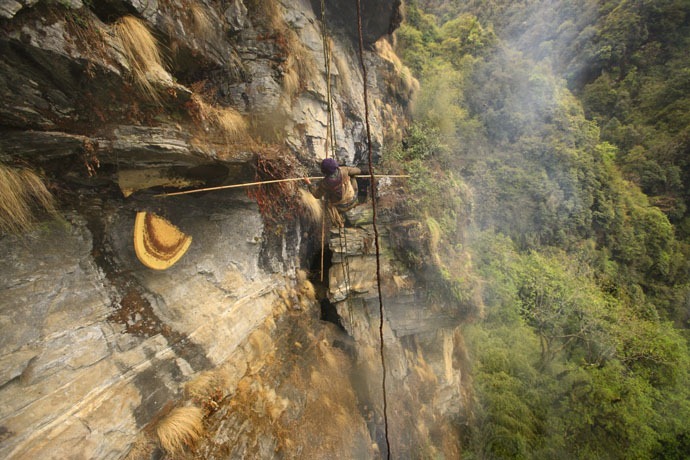 Its cliffs, home to Himalayan honeybees, are awe-inspiring because of their height and difficult ascent. 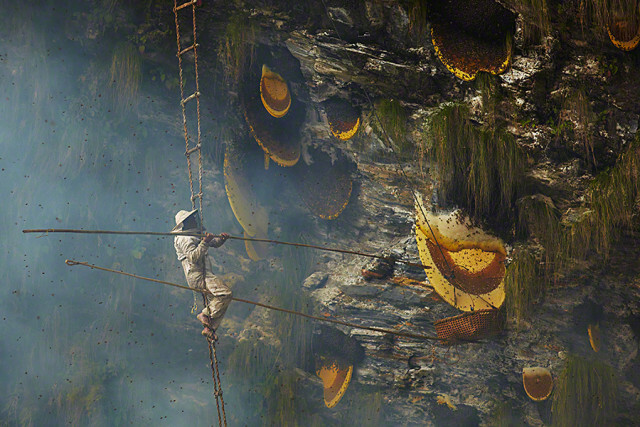 Large Himalayan honeybees build their nests (beehives) in the cliffs’ crevasses. Because the nectars come from wild flowers in the forests, the bees produce a rare honey with hallucinogenic properties, including euphoria and aphrodisiacs. As you can imagine, it’s in high demand. 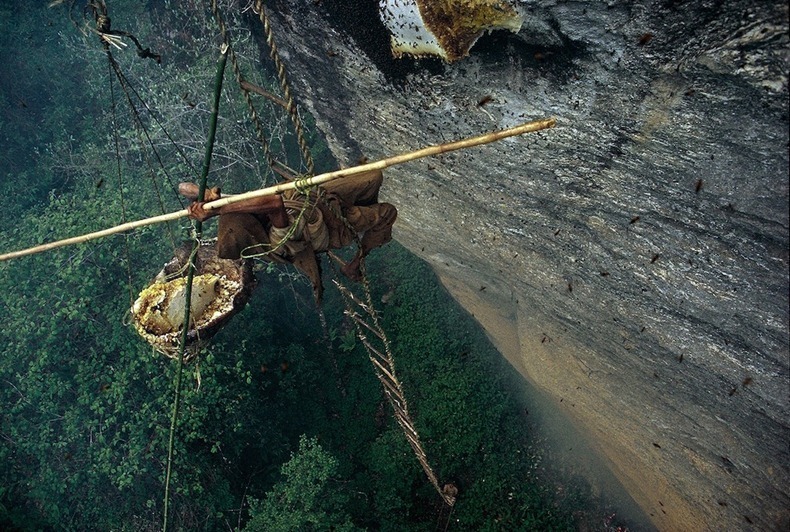 People are willing to risk their lives for a product like this; intrepid daredevils climb the cliff to extract honey, despite the fact that many past honey-hunters have lost their lives this way. As a young boy, I remember once tagging along with the honey-hunters of my village, watching the leader suspend from a flimsy rope ladder trying to harvest the rare product. When a hunter falls to his death during an ascent or a descent, it creates terror in the other members of his party. I once witnessed a tragic accident, which instilled in me an utter fear and respect for the mountains. Mountains have the power to provide provisions, such as sweet honey, fruits, fuel, clean water, and fodder for sustaining life in the village. They also have the power to kill. The Gurungs of my village perform rituals to the mountain before the hunt, showing extreme respect for the mountain and the spirits that reside in it. Hindus consider all mountains sacred because they believe that gods live in them. As a result, most mountains in Nepal are named after a Hindu god. Even the Buddhist Sherpas of Nepal call Mount Everest Chomolungma, the Mother of the World, and consider it sacred. Until the Western man set foot on Mt. Everest, Sherpas never climbed it because it is sacred to them. Likewise, Mount Makalu is considered the abode of Shankar, the Hindu god Shiva, in the same way as Mt. Kailash is the perennial home of Shiva. Like living beings, mountains, too, are alive, and they can express love and anger depending on how we treat them. While crisscrossing the mountain passes of Nepal, I noticed prayer flagpoles posted and chortens built along strategic locations of the mountainous territory. 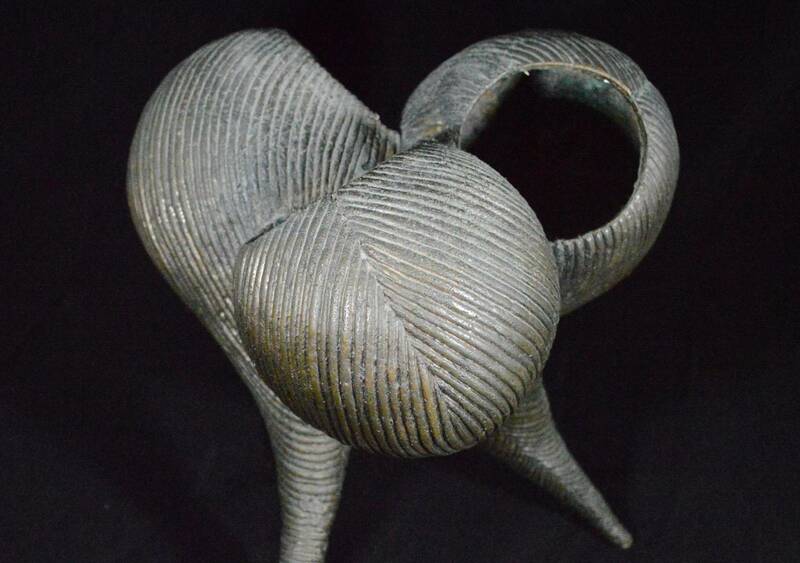 These are sure signs of respect and veneration of Nature. So, it has become a custom for me to bow to the mountain when I see one, no matter where it’s located. I’m glad that I live at the foothills of Mt. Baldy in Claremont, which the native tribes consider sacred.